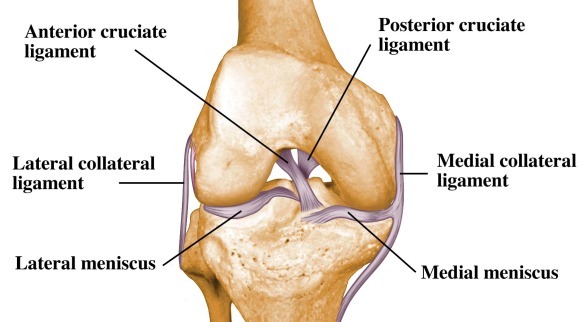 Your knee joint is formed by three bones; femur (thighbone), tibia (shinbone) and patella (kneecap). The ends of your bones are covered in cartilage which gives a smooth coating to the end of the bones and allows them to glide easily when moving. Cartilage is solid and flexible allowing it to spread loads over the surface and absorb shock. Cartilage has no blood supply so the nutrients are supplied by synovial fluid (a lubricating fluid inside the joint capsule). In a healthy knee there is a balance between cartilage degeneration and regeneration. Osteoarthritis occurs when cartilage degeneration exceeds regeneration. This loss of cartilage can cause an inflammatory response in the joint resulting in pain. Osteoarthritis is often called “wear and tear” however this phrase has caused many people to believe that they can’t/shouldn’t be active with osteoarthritis. This is not accurate as cartilage needs loads to regenerate. The rate of the loss of cartilage can increase with injuries to the knee, such as meniscal or ligament tears resulting in instability in the knee. Current best practice guidelines both nationally and internationally recommend exercise, patient education and weight loss as first line treatment. Knee joint replacement - This involves replacing the knee joint with a prosthesis. People have this procedure for end stage degeneration when they are unable to cope with the symptoms of knee osteoarthritis. Knee arthroscopy - Knee arthroscopy which involves inserting a camera into the knee joint and essentially do what is called a clean up. Trimming and tidying up any loose or torn structures. However, recent literature indicates that this procedure doesn't seem to have any long term benefits over exercise and should only be considered for extreme locking in the knee only. At Fitness Physiotherapy in Newcastle, we treat knee osteoarthritis with evidenced based treatments for pain relief and return to sport and play .